I love The Karate Kid and all it’s cheesy awesomeness. In the movie, the main character Daniel-san learns karate from his mysterious mentor, Mr. Miyagi. Thirty years after the movie’s release, I now realize how Mr. Miyagi’s lessons are equally applicable to customer service. The movie’s plot centers around Daniel-san’s efforts to defend himself against a bully. He initially tries to learn karate from a book but it doesn’t go well. Daniel-san’s fortunes improve markedly when Mr. Miyagi agrees to teach him karate. Mr. Miyagi imposes structure and discipline. He focuses Daniel-san on a specific objective, winning the All Valley Under 18 Karate Tournament and helps Daniel-san hone the skills he needs to win. Businesses must learn to improve customer service the right way too. Many executives think they can learn all they need to know about customer service by reading about it. In my book, Service Failure, I refer to this as Harvard Business Review Management. An executive distributes an article from the Harvard Business Review and tells the team "let's do this." The concept makes sense at a high level but fails spectacularly in its execution. A better approach is to impose structure and discipline while guiding the business to a specific customer service improvement goal. In a recent post, I laid out a step-by-step guide you can follow to take your company’s customer service to the next level. The impatient Daniel-san couldn’t wait to learn high-flying karate kicks and punches. Mr. Miyagi had a different plan in mind. He made Daniel-san complete an endless series of back-breaking chores such detailing a fleet of cars, sanding an endless deck, and painting a huge fence (on both sides!). Daniel-san grudgingly followed Mr. Miyagi’s orders until he hit a breaking point and challenged the wisdom of Mr. Miyagi’s training. That’s when Mr. Miyagi showed Daniel-san that the chores had actually been teaching him the basics of defense. Like Daniel-san, companies should focus on mastering the basics before getting enthralled with flashy new technology or the latest marketing trend. Negative service is nearly 4 times more impactful on loyalty than outstanding service. For example, your hotel might have a great location, great rates, and an unbeatable rewards program. None of that matters if your guest rooms are in this condition. The crane technique is one of the more iconic images from the Karate Kid. Mr. Miyagi tells Daniel-san the technique is indefensible if done correctly, and the movie devotes a montage sequence to show Daniel-san learning it. It’s important to note that Daniel-san uses this technique only once. He saves it for the movie’s climatic fight scene when he’s badly injured and must summon every last ounce of strength for one final move. It’s important for companies to win their moments of truth too. Perhaps it’s a challenging problem, an unusual situation, or just a golden opportunity to go the extra mile. Winning that moment can earn a customer’s loyalty while losing it may cause the customer to flee to a competitor. 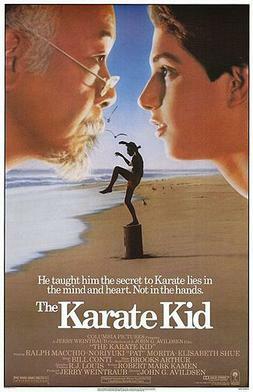 The crane technique is iconic to The Karate Kid because it was used at a pivotal moment. The same effect holds true when outstanding service is delivered at just the right moment. Most service is satisfactory, but it's the truly great or truly bad service that stands out. The real secret here is that companies must pick their moments to both satisfy and delight their customers. Note: Al Hopper often blogs about inspirational customer service lessons from popular movies. When I got the idea for this post, I wondered if Al had already done something about The Karate Kid. He had, but fortunately it was a different lesson. It just goes to show that The Karate Kid worked on many levels.